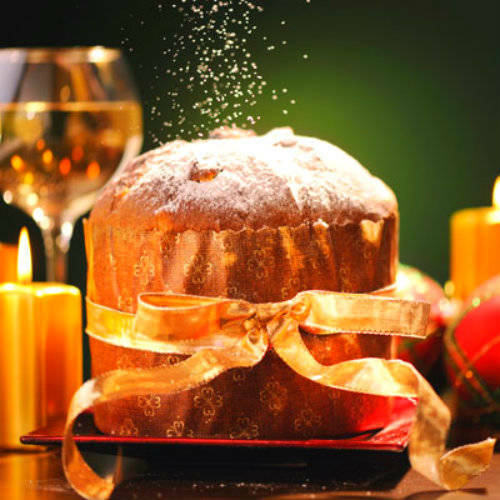 A slice of panettone and a flute of champagne (or prosecco)… there is no more Italian way to wish a happy holiday season. It’s a ritual in many homes where panettone is a welcomed guest after every meal. But this sweet bread can be enjoyed everywhere, anytime, even at office parties while exchanging gifts or in stores while shopping. 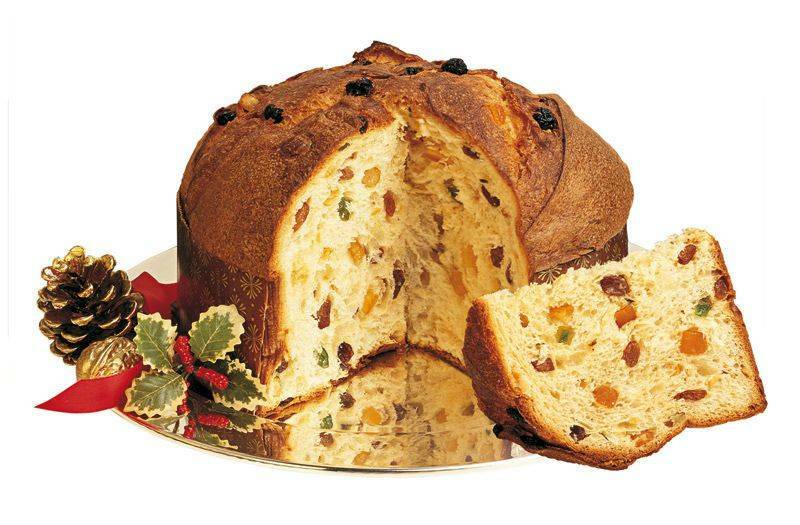 Giving panettone is not a simple act of kindness but a gesture rich in history and tradition. Panettone is a traditional cake-like bread stuffed with dried raisins and candied orange and lemon peel from Milan that has been embraced by fans worldwide. Immigrants to the Americas brought with them their love of panettone. When it is enjoyed on Christmas in many countries, it’s paired with hot chocolate, or ice cream, and even eggnog. Although the traditional recipe remains a favorite, producers are offering many variations with cream, chocolate chips and frosting, and even liqueurs such as limoncello. Italians consume an estimated two-and-a-half panettoni (5.5 pounds) per family per year, and its popularity is also growing beyond the Italian border, with seven to 10 percent of panettoni produced now exported to France, Germany, the United States, Canada, Britain, and Spain. Americans are adopting this pleasurable Italian food custom with enthusiasm. According to the latest figures from the Italian Trade Commission, pastry imports to the United States are always growing. Right after Thanksgiving, there are plenty of tempting panettoni on the supermarket shelves: from the tiny ornament-sized boxes to be hung on Christmas trees, to large ones sold in holiday tins and elegant gift wrapped ones, hidden in red and green foil with golden ribbons. Panettoni used to be available only at a few places like Neiman Marcus or Garden of Eden, but now you can find them everywhere. The name panettone can be explained in many ways: documents from the 1200s portrayed an early form of it enriched with honey, raisins, and even pumpkin. The writer Pietro Verri (1728-1797) called it “pane di tono” (luxury bread in Milanese dialect). Raisins are used for good wishes, as they are indeed known to bring fortune and wealth because their shape is reminiscent of golden coins. One of the legends of its conception says that the person who invented panettone was the Milanese nobleman Ughetto degli Atellani who lived in the 1400s. He fell in love with Adalgisa, the daughter of a poor baker named Toni. To win her over, the nobleman disguised himself as a baker and invented a rich bread in which he added to the flour and yeast, butter, eggs, dried raisins, and candied peel.The duke of Milan , Ludovico il Moro Sforza, encouraged the launch of the new cake-like bread: pan del Ton (or Toni's bread). Another story says that Toni, the young helper of a cook, was the real inventor. It was Christmas and the court chef had no dessert to offer. What he had prepared wasn’t good enough to be served. So Toni prepared something using everything he had available. Hence the name panettone, “il pan de Toni” (Toni’s bread). Just after the end of World War I, panettone became widely known thanks to a young Milanese baker, Angelo Motta, who gave his name to one of Italy 's now best-known brands. 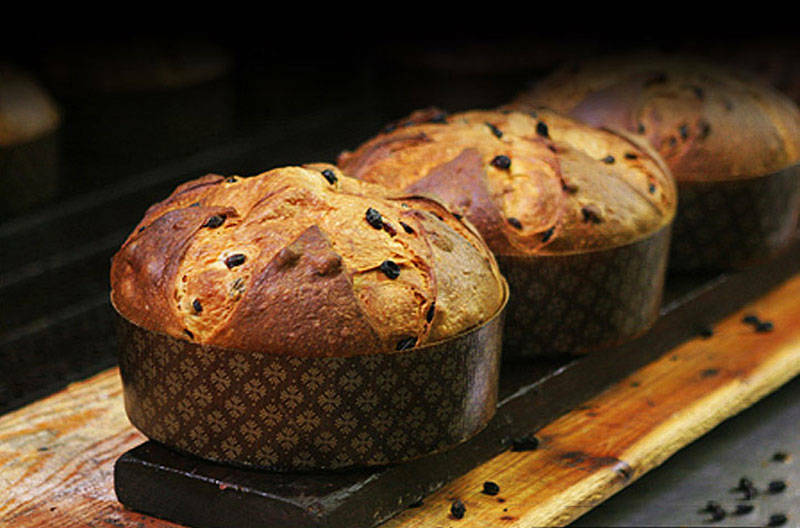 Motta revolutionized the traditional way of making panettone by giving it its tall domed shape by making the dough rise three times, before cooking, which is what makes it so light. Around 1925, the recipe was adapted by a competitor, Gioacchino Alemagna, who also gave his name to a popular brand that still exists today. The stiff competition between the two led to the growth of the industrial production of the cake-like bread. rather than butter or powdered eggs instead of fresh. To ensure a high-quality product, the Association of Italian Confectionary Industries (AIDI) has asked the Italian government to recognize panettone as a specialty item deserving protection. If successful, only producers meeting strict standards will be able to identify their products as panettone. Among the brands meeting AIDI requirements are Alemagna, Bauli, Flamingi, Maina, Motta, Perugina, Le Tre Marie, and Valentino.